This is another recipe from one of Jamie Oliver’s latest books 15 Minute Meals. So far none of them have been close to the fifteen minute mark but they’re quite tasty nonetheless. After the success of Jamie’s seared tuna with jiggy jiggy greens I decided to give another recipe a go. This one stood out due to the lack of complicated ingredients and I was really curious to see how these coconut buns would come out. I simply followed the recipe and made the dough in a food processor and then steamed them and surprisingly they came out looking pretty profesh if I do say so myself. However, I wasn’t a huge fan of the taste- I did use all the coconut milk but they didn’t have a very strong coconut taste. They were a bit bland and I didn’t feel like there was enough sauce to scrape up with the buns. When I make this recipe again I think I’ll do the chicken stir fry with Jamie’s coconut rice instead and see how that goes. Overall it was a good weeknight recipe and I loved the simple flavours of the stir fry. I used an adapted version of Jamie’s recipe that stir fries the chicken and veggies instead of steaming them. 1. For the coconut buns: Pour the coconut milk into a food processor. Use the empty tin to measure out the self-raising flour, you’ll want two tins worth of flour. Add the flour and 1/2 tsp of salt to the food processor and process until a dough forms. Lightly knead the dough onto a lightly floured surface, then roll out small balls of dough. I was able to make about 9 small buns. If the dough is too sticky just add some more flour to your workspace and your hands.Place the dough into large muffin cases and place, in a single layer, into a steamer basket with a lid. Put the steamer over a pot of boiling water and steam for 10 minutes. 2. For the chicken: Place a wok over high heat and add the vegetable oil. When hot, add the chicken in pieces and stir until the chicken is browned, about 3 minutes. 3. Place the broccolini in a microwave-safe container and microwave for 50 seconds. 4. Add the broccolini and mushrooms to the wok with the chicken and stir for 1 minute. Add the oyster sauce and stir until the chicken and veggies are coated and heated through. 5. 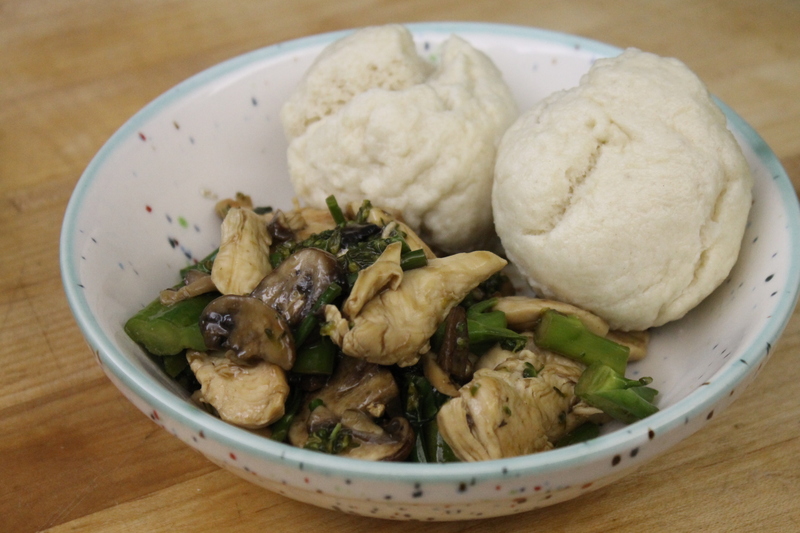 Serve the chicken and vegetable stir-fry with the coconut buns. Sprinkle with sesame seeds and squeeze a bit of lime juice over the top.